Hello! I’m Allison, owner and creator behind Garland & Pendant, a hand embroidery business. I am also wife to my best friend, Steven, and mother to three children under 5! Naptime is business time, where I can be found hand-embroidering all of the things(while binge-watching Netflix, of course). This interest in making things by hand and all things DIY began in 2010, when I was preparing all of the decorations for our wedding. This was the first time since Home Ec. in Middle School that I had used a sewing machine. I quickly began to realize that I had the ability (as does everyone) to create almost anything I wanted. After I was married and moved into our first home, I began the blog ReCreate, where I chronicled lots of DIY home decor projects while I nested as a newlywed. This quickly turned into a desire to start a small business. And let me be honest for a second…I created an Etsy shop before I even knew what I would begin selling! Garland & Pendant officially opened in 2010. Back then I was creating and selling hand-painted wooden signs. I made 7 online sales, a handful of locals sales, and A LOT of mess. I quickly tired of it and realized that this wasn’t for me……BUT, I still had a strong desire to have a successful handmade business. I began embroidering a little under three years ago when I was given a beginner’s DIY embroidery kit for Christmas. 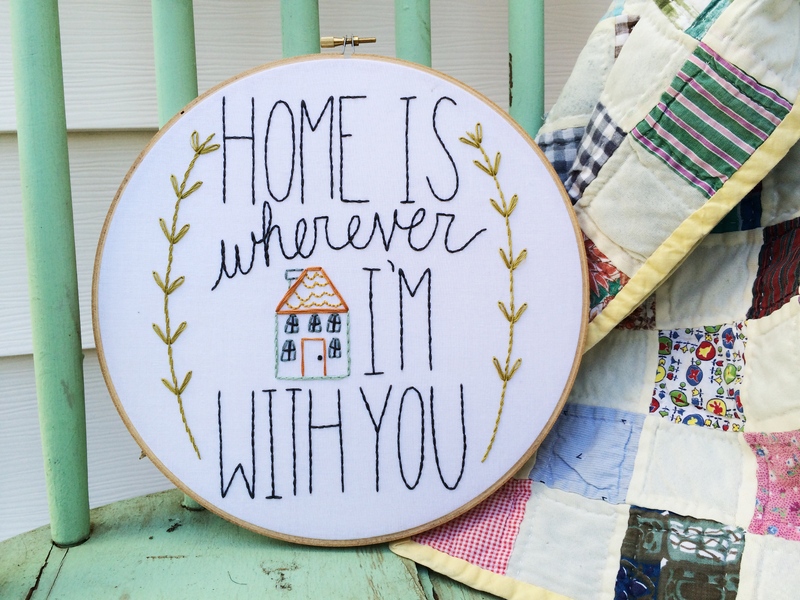 As a stay at home momma of three, embroidery became a beautiful hobby that was easily accessible during nap time and I immediately fell in love with the therapeutic rhythm of the needle pulling thread through fabric. In September of 2013, I started embroidering gifts for others, and by March, I had opened up shop(once again) to begin selling my creations. In the winter of 2015, our youngest daughter Willa was diagnosed with Retinoblastoma (cancer of the retina) when she was just 10 weeks old. I had no idea at the time that my growing hobby of stitching would become such a peaceful outlet for me in the midst of so much uncertainty. There have been many times in the past year that I’ve ignored my desire to create, becoming overwhelmed with the weight of life’s changes and tragedies. Soon after Willa’s initial diagnosis, my husband quit his job, we sold our home in Johnson City, Tennessee, moved to Wake Forest, put our son in preschool for the first time, my husband went back to school and then accepted a new job two weeks later, we bought a house in Raleigh and moved in about two months later. Lots of change. Pretty traumatic. I’d placed my creative heart and ambition in the background, waiting for a time when all my children were healthy and things were back to “normal”. Needless to say, I missed the healing effects of using my hands to make things, and soon stopped halting my creative endeavors, realizing that life might never slow down enough to feel normal again. I am overjoyed to embrace this small business dream of mine once more, and hope to avoid abandoning my creative side while walking through life’s valleys.